Qualifications: P.G.Dip.Teach, B.Mus; Adv. Dip Jazz; Dip.ABRSM; B.Sc, IRMT(Member). Pricing: Beginners / Intermediate 10 x 30min - $320. Advanced/Jazz: PAY AS YOU GO: $70/hr OR $95 - 1.5hrs Intensive OR 6 Hrs PREBOOKED (Scheduled as desired) - $400. Mobile lessons also available. (Minimum 1 Hr lesson, Travel Surcharge applies). Suitability: All Ages, Levels, Styles! Children & Adults Welcome! Keyboard & Piano Jazz & NCEA. FUN FUN FUN! All music lessons must be FUN! – and meet the individual needs of each student. Be it learning to play a few simple songs, OR, follow a long-term path, – understanding melody, harmony and rhythm fully; – I aim to encourage students to direct their own learning; – and foster good habits, technical skills that promote creative musical enquiry. I like to go the extra mile to ensure each student can develop musically on their own, and direct their own musical journey!. UP TO YOU! – HOW YOU’D LIKE LESSONS SCHEDULED! I understand every-ones requirements (and busy life schedules!) are different! Young students often prefer regular weekly half hour lessons, whilst adults/jazz students may prefer “flexible” fortnightly/monthly lessons for an hour or more. Happy to chat & discuss what you require & requested learning outcomes, specific skills. Please request discounted introductory first lesson with mention of nzmusicteachers website – to see how lessons work!. No obligation to continue. Block bookings preferred thereafter – for total of 5 hours. (Either 10 x 30min lessons OR 5 x 1 hrs lessons) – so I can tailor make your series of lessons – just for you! Please feel free to call & chat about your musical requirements. Pieter Bos. Classical Piano from 7 years. -Grade 7; Commenced Jazz Studies age 17. 2000: Post Graduate Diploma Teaching (Secondary Music Teaching). 2000: ABRSM Dip. Jazz Teach. (Scholarship, London) Jazz teaching and performance techniques. 2016: Sec. Teachers Refresher Cert. (NZ Teachers Council # 205899). Children & Beginners: Currently: Wellington Music Center (Saturday Mornings). 1996 – 2004: Technics Music Academy, Raroa Music School, Hutt Intermediate Keyboard, Newlands Intermediate, Island Bay Music School, Wellesley Collegiate, Private Practice. Secondary Schools: Currently: St Patricks College, Silverstream (Piano Tutor 2 Days per week). 1996 – 2004: Scots, Petone, Onlsow, Naenae, Bishop Viard, Porirua, Sacred Heart, Rongotai, St Patricks Colleges. Tertiary/Adults: Currently: Wellington High School – Adult Community Education. Preparing students for Massey & Victoria University music degrees. 1996 – 2004: National High Schools Jazz Workshop (2000, 2001, 2002, 2008, 2011). 2008: Massey University Tutor: Jazz combos and latin ensembles. PERFORMANCE EXPERIENCE: Since 1997 Pieter has worked extensively as a pianist, keyboardist & vocalist in bands, large ensembles and leading trios & quartets. This, along with strong technique and sound knowledge of theory, harmony & improvisation; – has enabled him to develop a unique creative performance style. This versatility & skill has enabled Pieter to teach all styles of music -Popular, Rock, Jazz, Blues, Funk, – to Easy Listening & Classical Music. International Performance Experience includes piano & vocal residencies with Hyatt, Sheraton and Shilla Hotels – in South Korea, Argentina, & Japan. 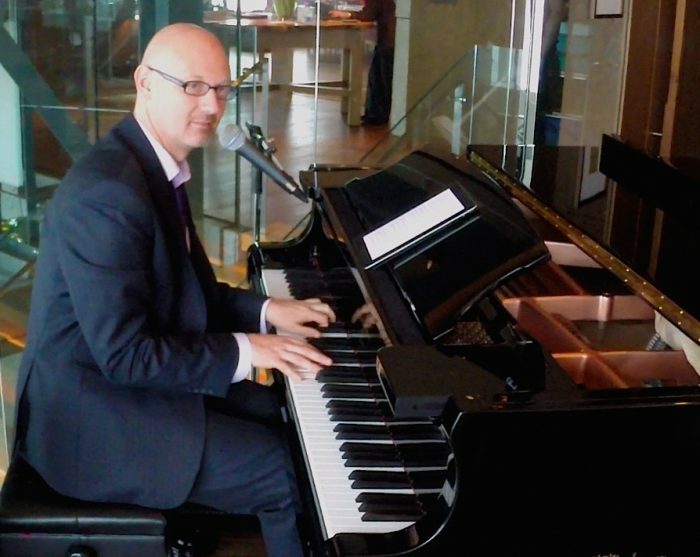 From 2011 – 2014 Pieter lived & performed as piano/vocal entertainer in South Korea. Prior, from 2004 – 2010 – he travelled the globe, performing in most musical genres & capacities, for many cruise lines. FUN FUN FUN! All music lessons should be Fun! & serve the individual needs of each student. Be it learning to play a few songs of choice, or follow a long-term path; – I aim to encourage students to direct their own learning; – and foster good habits & technical skills that will encourage further creative musical enquiry. In all lessons – Repertoire, Ear training, Sight Reading & Musicianship is taught. Irrespective of age & ability, – in all lessons students will learn fundamental technical aspects and theoretical (harmonic, chord-scale relationships) – principles using both classical and jazz teaching methods. These are built upon in subsequent lessons to be used in music reading, theory & understanding & use in improvisation. Beginners & Children: Of course require a little more guidance and direction. My primary goal is to foster a lifetime of musical enjoyment in young students! I believe the key to teaching music to children is loads! of enthusiasm & energy! Individual piano & keyboard classes start around age 7 upward and are very interactive. Along with learning fun, personally chosen – songs, children & beginners will develop strong reading & listening skills and some basic creative skills. Please see attached Testimonial below.